The Best Hitchcock Films Hitchcock Never Made Blogathon. Now, that's a mouthful. Say it fast three times in a row. Ha! This blogathon was the clever idea of movie belle-dames, Dorian of TALES OF THE EASILY DISTRACTED and Becky of CLASSIC BECKY BRAIN FOOD, they are doing the hosting duties which began on the 7th and will run through Friday the13th. Lots of movie mavens signed up (including yours truly) so be sure and check out the links and see what films are being talked about this week especially if you're a Hitchcock fan or even if you're not. What the heck, take a look, you'll probably find several films that will pique your interest. Figuring out a code messages, typical honeymoon activities for Joan and Fred. 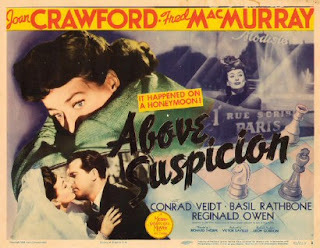 ABOVE SUSPICION is a 1943 film directed by Richard Thorpe, starring Fred MacMurray and Joan Crawford. It is based on the book by famed suspense writer, Helen MacInnes. Though the book is superior, I have still enjoyed the film over the years primarily because of its terrific cast. The film also stars Basil Rathbone as an evil Nazi and Conrad Veidt as quite the opposite which was a nice change of pace for him. Oh, spoilers, spoilers, you'd have figured it out really quickly anyway. Especially since Basil Rathbone's character, Sig von Aschenhausen comes equipped with a steely-eyed, dragon-mama - sort of like Claude Rains's mother in NOTORIOUS, only perhaps, not as awful. 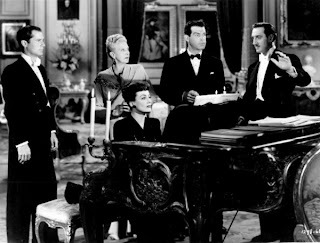 It's 1939, the setting (at least for the first few minutes of the film) is Oxford. Frances (Joan Crawford) and Richard (Fred MacMurray) Myles are a newlywed couple off on their honeymoon. He's a professor at Oxford even though he's an American - probably a 'visiting' professorship. This is before war was delcared so Germany was still not out of travel bounds. But before their wedding night can get down to business, an old friend from the foreign office shows up and offers the disconcerted couple a chance to do a bit of spying in the south of Germany. It's nothing much really, just track down an agent who has gone silent, get a secret bomb formula (Hitchcock's maguffin) and a list of secret German agents who can still be trusted. Oh, is THAT all? Jeez. The formula will help the Brits deal with a new magnetic bomb the Nazis have developed. Hardly the sort of thing you'd send amateurs into, but that's the story. Richard and Frances are supposedly above suspicion because of their innocent countenance + their trip really is a honeymoon + who would suspect two rather bland Americans. Well, Fred MacMurray certainly is bland enough, but maybe not Joan Crawford. She can't help looking a bit too sophisticated for him and for the the film (her face really does grab the screen), but I guess I'm being picayune. Though I wish Fred would learn to wipe the smirk off his face. That's really my only objection to his playing a Nazi fighting hero. You know who would have been great in this part? Robert Donat. 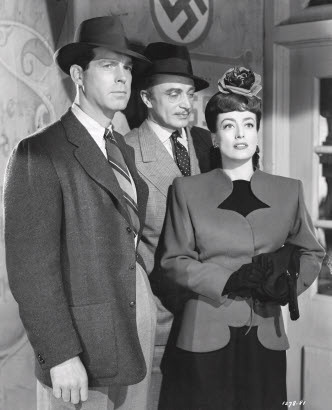 Fred MacMurray, Conrad Veidt and Joan Crawford. In the film, she's just stepped on Veidt's toe. 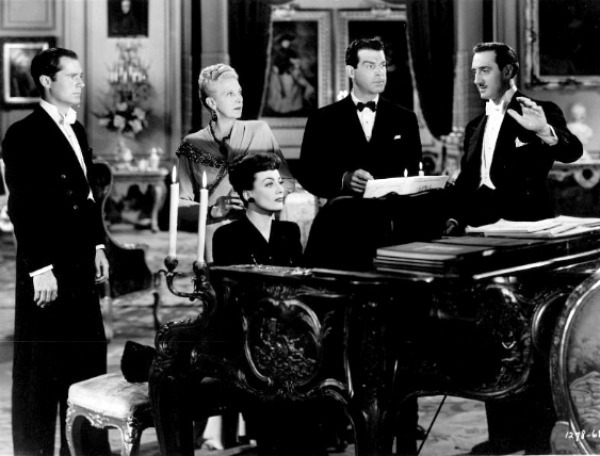 At a Liszt concert one evening, they meet up with old Sig von Aschenhausen (Basil Rathbone looking dashing in a tux) and his mom - both Sig and Richard had been Rhodes Scholars at Oxford. During the concert, the kommandant of a concentration camp (in the audience) is shot dead during a particularly loud explosion of cymbals and drums. That's the mom in the fur. But almost immediately, Sig suspects his old 'friend' from Oxford as well as Thornley who can't stop sweating. One must assume that Sig is particularly sharp though he doesn't actually seem to be later in the film. At any rate, the dragon-mom invites Frances, Richard and Thornley to dinner at her Schloss. The three can hardly refuse after Sig has cleared the way for them to leave the concert hall. After dinner, Sig reconstructs the killing at the concert with appropriate music played by Frances (she can play Liszt), putting everyone on edge. Poor stiff Thornley on the far left - sweating. Later back at the hotel, after deciphering a couple of secret messages, Frances and Richard must then make a connection with a certain Doctor Mespelbrunn who will more than likely have the info they seek. (Remember the macguffin?) Once they have it, they'll be home free to leave Germany and continue on their honeymoon. I won't reveal much more except to say that Conrad Veidt (whom I adore as much as I do Basil Rathbone) turns up out of the blue just in time to save the day at one point. He'd met the couple early in the film and behaved suspiciously enough to fool us into believing he was something other than he appeared to be. What he was was a particularly good spy. The one and only Conrad Veidt who, with his family, actually fled the real Nazis in the nick of time. 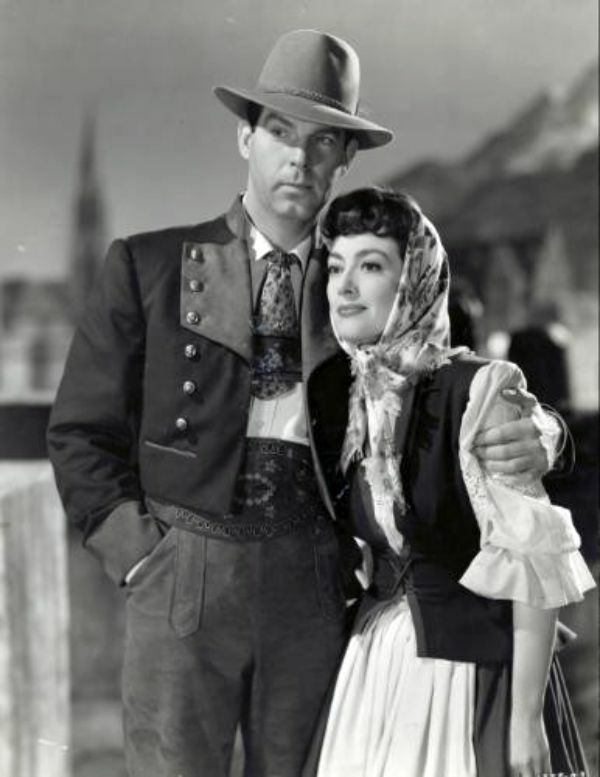 At one point in the film, Richard and Frances are called upon to pretend to be simple-minded country peasants in typical lederhosen type costumes - Joan gets to wear a babushka and looks very fetching. Happy peasants in Nazi Germany. Production values on the film are not all that great, it's mostly back-lot MGM/faux Germany and lots of rear-projection, something Hitchcock also used in his early films. But I usually make allowances for that if the story and cast are good enough. And I admit that though the plot has holes in it big enough to drive a whole Panzer division through, it still has many exciting moments. The cast (except for MacMurray's smirk) is terrific and I am always up for a film in which Nazis are outwitted. Basil Rathbone at his fiendish best is always a treat. Plus I love Conrad Veidt and Reginald Owen too. My favorite scene in the movie? The one in a nightclub where Conrad Veidt's character (Hassert Seidel) dances a lively tango with a plump middle-aged lady. They are both light on their feet and quite wonderful. To my mind, the most Hitchcockian character in the film is Conrad Veidt's. It's all in the hints of hidden depths which Veidt creates with little more than facial expression and an angled fedora. In a way he is a caricature and in a way he most definitely is not. The dance sequence I mentioned has lots of Hitchcockian humor in it, though there is not a hint of making fun of the overweight woman - don't know that Hitchcock would have put up with an overweight woman without making her a joke. But I could be wrong. I am not a Hitchcock scholar. If Hitch had made this film, I hope he would have tightened the plot, made the camera-work a bit more interesting AND the humor a bit less juvenile. Example of ABOVE SUSPICION humor: The last line, once the happy couple is safely across the border in Italy: "C'mon, let's get some spaghetti." Not the sort of thing Hitchcock would have condoned. I don't think. This kind of flippancy only works if the actor saying it is playing against type, i.e. if Cary Grant said it, THEN it would work. The killing at the crowded concert though, was right up Hitch's alley. Especially the cutting back and forth from the orchestra to the white gloved hand holding a gun hidden behind a program. But except for two or three brief scenes, the one thing missing from ABOVE SUSPICION, the main thing I think Hitchcock would have brought to the table, is intensity. This film is more escapade than real suspense, but to tell you the truth, despite my quibbles, I love it anyway. Currently, you can only either buy the DVD, watch the movie when it turns up occasionally on Turner or pay Amazon 3.99 and watch it as a rental on your computer. I was lucky enough to record this from TCM back when we still had a Tivo and I really enjoyed it. Although, Joan Crawford might be a bit too glamorous to be the wife of an American professor! I always like Fred MacMurray and Jean Arthur together, though. Or maybe another pairing with Barbara Stanwyck? Oh, Jean Arthur would have been perfect in this. Why didn't I think of her?? Barbara Stanwyck might have been too glam, same curse as Joan Crawford. Ha! I've never seen this movie but it sounds intriguing, Yvette. Totally unrelated to the movie but I've always adored the actor's name "Basil Rathbone"...pronounced with an English accent, of course! Are you a fan of the BBC comedy "Fawlty Towers"? I loved that John Cleese was "Basil Fawlty" in it. Yvette, your BEST HITCHCOCK MOVIES...NEVER MADE post about ABOVE SUSPICION was a wonderful read, well worth waiting for, and a delightful addition to our Blogathon! I always enjoy your cheeky wit, especially this passage: "It's nothing much, really, just track down an agent gone silent...get a secret bomb formula...list of secret agents who can still be trusted. Oh, is THAT all? Jeez." I bet the Foreign Office folks who roped the newlyeweds into this spy-type-gig wanted them because they worked cheap, or maybe they figured they'd save money on their honeymoon! Much as I enjoyed the movie once I finally got to watch the whole thing, there were times when I couldn't help thinking, "Where's Madeleine Carroll and Robert Donat when you need them?" :-) Still, with that great cast (Basil Rathbone has played villains, of course, but Veidt as a German on the side of the angels really impressed me!) and the suspenseful touches, it seems churlish to complain! It's a shame that ABOVE SUSPICION turned out to be Conrad Veidt's last film; I bet if he'd had today's doctors, he'd have lived to a ripe old age. I remembered he'd fled those rotten Nazis in real life. Thanks for joining our Blogathon fun, Yvette; always happy to have your charming and witty virtual company! You really crack me up Yvette: "But before their wedding night can get down to business" - genius! Glad to hear this one is on DVD as I've never caught up with it and while there's a reason Richard Thorpe was knowing for getting everything in one take, this also sounds like fun - cheers! Or rather, prost! What an interesting selection for the blogathon and it really works. 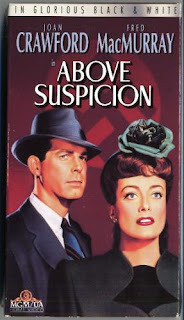 My imagination must have been asleep the last time I saw "Above Suspicion". Next time I'll watch it in a Hitchcock frame of mind and have as much fun as I had reading your article. I loved Fawlty Towers, Pat. I think you'd enjoy the movie, Pat, if you like this sort of thing. The odd thing is that Veidt had the physicality of a man who would live a long time. You know, thin and boney. But perhaps he had a bad heart that went undiagnosed. Wikipedia says he was playing golf when he collapsed. Such a damn shame. I simply adored him as the evil vizier in THE THIEF OF BAGHDAD. Oh, Richard Donat would have aced it. Thanks, C.W. For whatever reason, it was the first film I thought of when I read about the Blogathon. I have seen and enjoyed “Above Suspicion” on several occasions, and what makes the film better than a simple way to pass the time (as you pointed out) is Rathbone and Veidt doing what they did best. Your observation that both Richard and Frances are “above suspicion”, in part because each is also rather bland, is hilarious. Unlike a Hitchcock plot, this couple is aware of the danger they face from the beginning, and perhaps this reflects some of the unease in the states at the time. Perhaps not in the same category as, say, "Foreign Correspondent", but an entertaining film just the same. I have never seen this. My husband has been dying to read that book for years too. And Joan Crawford is one of my least favorite actresses. 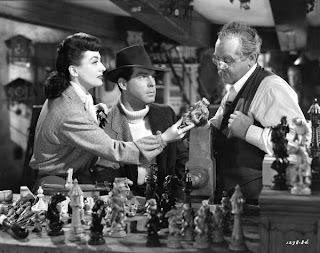 Yes to Arthur or Stanwyck, Lupino, anyone. Fantastic pick Yvette. I may have heard of this film, but I am not sure. In any regard, definitely sound like you found something right up Hitch's alley. LOVE the costume design particularly the peasant costumes of McMurray and Crawford. Fun pick! And really ... Joan vs. the Nazis -- is there any contest?? An enjoyable film, so thanks for thinking of it for this blogathon! I love old films and Fred MacMurray but I don't like Joan Collins at all. What a neat idea for a blogathon! Patti, actually, Joan is kind of sympathetic in this role. I'm not her biggest fan either, but this isn't obnoxious at all. The book is terrific. At one time I'd read all of Helen MacInnes, but damn if I can remember. I wouldn't mind rereading her stuff if I came across it again. Whistling Gypsy: Very entertaining, indeed. I thought about buying the DVD to add to my library and that's about the highest compliment I can give it. I don't buy a lot of films. I think the funny part about the happy couple being bland, now that I think on it, is that Fred and Joan do stand out from the cast of characters they run into. It's difficult, especially for Joan, to 'blend'. Ha! For when you're in the mood. You're welcome, Classic Film Boy. Thanks for stopping by. I know! Pity the poor Nazis. HA! Don't let her deter you from the movie. It's terrific. What a terrific -- and hilarious -- movie review from Yvette's Critics' Corner. You never disappoint with classic movies. 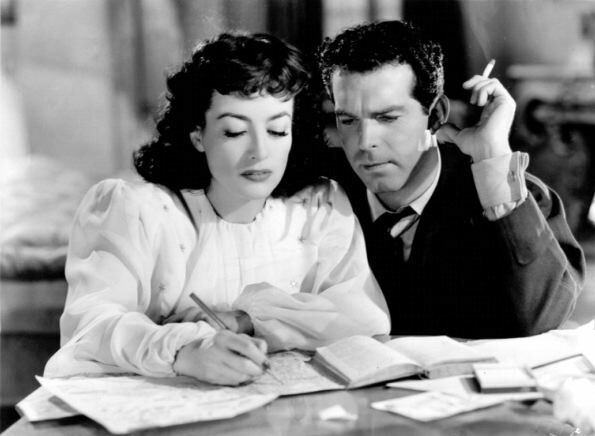 The one thing I don't find believable is Fred MacMurray and Joan Crawford as "peasants." Not quite. They don't blend into the countryside, nor can I picture them milking cows or cleaning stables. Will put this on my library wish list. I think you'll like the movie. Hope you get a chance to watch it. The more I think on it, the more I like the Jean Arthur idea. I love how you've written this. I'm a sucker for a Joan Crawford movie and I CAN'T BELIEVE I haven't seen this!! Thanks for a wonderful review. This is a really good movie. You told it well. I saw it sometime ago and it was good! Yvette - a wonderfully written post! Csn you imagine if Hitchcock and Crawford worked together? It might have been a bit of an off-screen battle, but I bet they would have brought out the best in one another. I loved this post - really!!! It's one of those films that isn't always available on Turner or elsewhere. Prior to watching it for the post, I hadn't actually seen it in years. Thanks, Yvonne! Yes, this is a really fun movie even if it is about not so fun doings in a very ugly time. The book is excellent, if you haven't read it yet. Thanks, Flick Chick! It was a lot of fun to write and I guess maybe that shows. I love this sort of movie and always will. I wish they still made 'em. 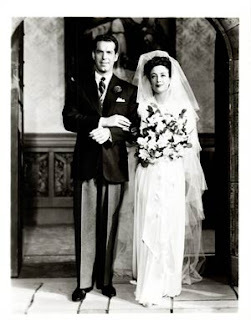 Barbara Stanwyck is about the only person I can handle Fred MacMurrary with, though I'm really curious to seet his movie now. I'm going to have to cave and get Netflix, I can just feel it coming. The library just doesn't have every classic movie, but 500 of the latest George Clooney film! Ryan, you should see it. It's the most special because of Basil and Conrad, of course. Kathy, this wasn't on Netflix. I watched it on Amazon rental (they send it directly to your computer). Various prices. This one was 3.99. They seem to have a huge selection. But you have to pay per view. I don't do it often, just when I simply must see a film that's not available on Netflix. By the way, Netflix streaming is about 9 bucks a month. That's not too bad. Though you can't always get the films you want to see. Hulu has a good selection too but I rarely use them becuase they include commercials - sort of like regular TV. No thanks. Yvette, This is a film that has escaped my radar, so your piece is my introduction to it. 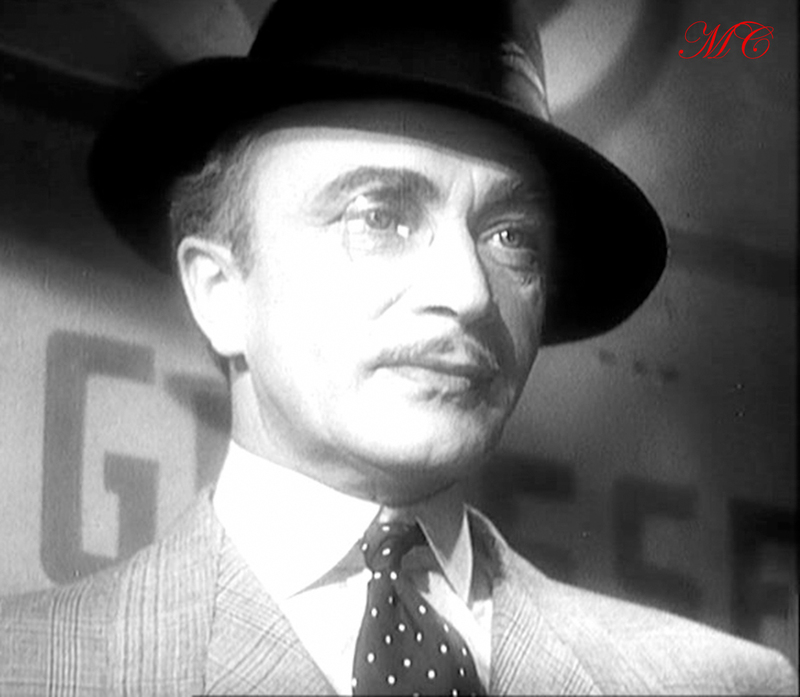 Like you, I adore Conrad Veidt (my favorite of his is "A Woman's Face" also with Joan) and will watch him in anything. What interests me most in your description of the Hitchcockian elements of "Above Suspicion" is the Nazi mama's boy his Nazi mama. That particular set of characters was a stroke of genius in "Notorious." The Lady Eve: Yes, the mama's boy. The comparison didn't hit me until I was writing the post. Basil's character could just as well have there with a wife or fiance or whatnot. But the mother being there and being of a certain type, tells us a lot about the character. This is a terrific film, Eve. Don't miss it. Enjoyed this review, Yvette. I’ve read the book and seen the movie and agree that the book is better. Veidt often played evil Nazi’s, which I think was his way of contributing to the war effort. He was in a favorite of mine called ALL THROUGH THE NIGHT, a comedy with some very serious moments. In it Humphrey Bogart and his gang of wiseguys discover Nazi agents up to no good in New York City. 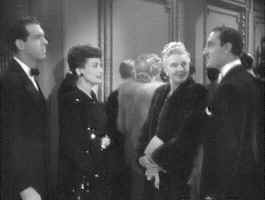 Yvette – Also William Demarest, and wasn’t he a great character? 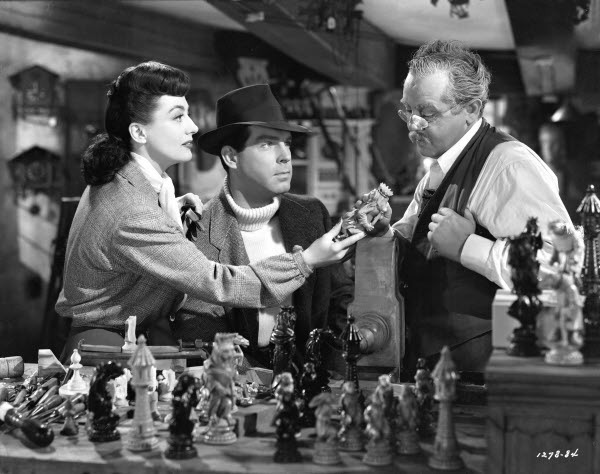 I didn’t appreciate him until I discovered the many Preston Sturges films he was in. Yes, another member of the character actors' hall of fame - which there officially isn't, but definitely should be. Maybe it's time for a new blog. :) Demarest was also in the long running television series MY THREE SONS - if I'm remembering correctly.